Western North American Forests represent a potential, yet uncertain, sink for atmospheric carbon. The Mt. Bigelow eddy covariance site is located on a sky island, (a type of continental terrain consisting of a sequence of valleys and mountains isolated by the surrounding desert floor), in the Santa Catalina Mountains of the Coronado National Forest, NE of Tucson, Arizona. This sub-alpine mixed forest ecosystem of predominantly of Ponderosa Pine (Pinus ponderosa), Mexican White Pine (Pinus strobiformis Engelmann), Douglas fir (Pseudotsuga menziesii), and Chihuahua pine (Pinus leiophylla), with occasional Southwestern white pine (Pinus strobiformis Engelmann) and White fir (Abies concolor). Much of the woody regeneration in the sub-canopy is Douglas fir. These species exist only at the tops of mountains in this region because it is only here that, as a long-term average, precipitation input exceeds evapotranspiration to the extent that forest vegetation can survive. Critical Zone science is a biogeographical science! 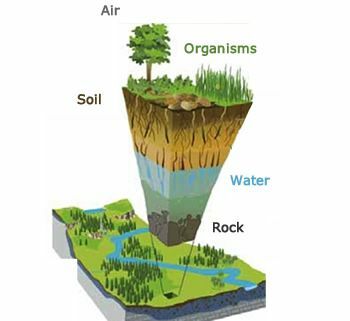 Regardless of the lingo, we're all looking into the complex interactions and feedbacks among these dynamic layers of the Earth's surface, and we are working across disciplines to do this science! We have a hard time understanding the processes underlying the patterns we see within our own research unless we can put it into the greater context of a site or region. * Consider the role of complex topography (the influence of slope and aspect) on all of these factors. * Support research by graduate students and visiting undergraduates participating in our NSF-funded Research Experiences for Undergraduates program. There are opportunities for graduate and undergraduate research in all aspects of this work - contact us via the "Join Us" tab above.